Fade and Weather Resistant: marine grade, wick-stop thread seals the stitch holes. More durable and longer color retention. All Rampage soft top seams are sealed for a weather tight fit. Self-Correcting Zippers: All Rampage tops incorporate self-correcting zippers on their windows. Zippers run smoother and last longer – Extremely crucial on those heavily used door windows. OE Style and Fit: Every Rampage Top uses the Patented OE Style belt rail seal. It is just like the original equipment design-seals out water and it's a cinch to use. Adjustable Door Panels: Door panels have a double adjusting system that ensures a snug, tight fit. Other soft tops use a single adjustment that is hard to use and does not provide a tight fit. Tinted Windows Are Standard: Light automotive tint on the side and rear windows is standard on Rampage replacement tops. Hardware Not Included: Soft top kits include full skin and windows only. Original soft top hardware and door frames are required for installation. 2 Year Warranty: Rampage replacement tops have a full two year warranty. 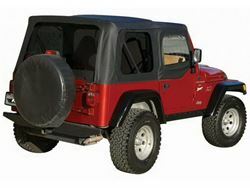 Replace aging, worn out factory soft-top and gain some additional storage space inside the driving compartment. All the features of the original factory top with exclusive Rampage additions ? two zippered storage pockets. Produced in original factory specifications and colors, the Rampage replacement top easily installs over factory framework, and attaches to factory mounting points and Original Equipment belt rail attachment System. Fits all factory applications and includes the top fabric, clear or tinted windows and, where applicable, includes upper door skins that slip over the OE upper doorframes.